Apparently Nigel Lawson, Chairman of the Global Warming Policy Foundation, met with members of the Royal Society to discuss climate science and climate policy. Nigel Lawson has reported on aspects of the meeting in a Spectator article and is implying that – at the insistence of the Royal Society – the details of what was discussed remain secret. The article, however, actually says that the Royal Society insisted that there be no press present, which is not quite the same as insisting that the details of the meeting remain secret, but maybe they did insist on that too. I readily accepted his offer….. The charge that my critical views about climate change policy are based on inadequate exposure to reputable scientists was always absurd, not least given that the academic advisory council of the GWPF has on it, among others, the world’s most highly regarded physicist, Professor Freeman Dyson of Princeton, arguably the world’s most eminent climate scientist, Professor Richard Lindzen of MIT (who flew over for the meeting), and three Fellows of the Royal Society. Well Freeman Dyson is indeed a great physicist, but that doesn’t necessarily imply that he’s an expert at climate science. 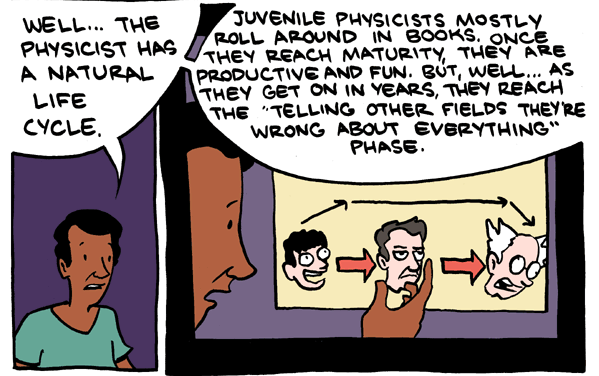 His views on climate science are motivating various rather uncomplimentary cartoons, such as the one below from SMBC comics (although, to be clear – if you do follow the link – I don’t think that Freeman Dyson should be put down). Furthermore, if you were to read this I don’t think one would conclude that Richard Lindzen is one of the world’s most eminent climate scientists. So, are there others on the GWPF’s Academic Advisory Council who might be giving suitable advice about climate science? Well, I count 7 economists who, presumably, are largely unqualified to give advice, specifically, about climate science. There’s a physicist who thinks rising atmospheric CO2 concentrations are fine because CO2 is plant food. There’s Henrik Svensmark who has suggested that our climate is sensitive to the flux of galactic cosmic rays (GCRs). The latest results from CERN’s CLOUD experiment suggests that the cosmic radiation that bombards the atmosphere from space has negligible influence on the formation rates of these particular aerosols. There’s an astrophysicist who has mainly worked in the media, another astrophysicist who thinks it’s the Sun (it’s not), a biochemist, a geologist, a science writer (who is probably more famous for being Chairman of the first UK bank to have a run on its finances in over 100 years), an electrical engineer, and a biogeographer. So Nigel Lawson may well believe that he’s getting adequate exposure to reputable scientists, but there’s very little evidence to suggest that he actually is. There are 25 people on the Academic Advisory Council, but only one is actually a climate scientist (Richard Lindzen) and, as far as I can tell, is not particularly well regarded by his peers. There appear to be 14 others with science backgrounds, but only two seem to have done research in an area related to climate science and both have theories (GCRs and the Sun) that have largely been shown to be incorrect. So, it’s quite hard to believe that he’s referring to the GWPF’s Academic Advisory Council when he suggest that he’s getting adequate exposure to reputable scientists. I have sometimes wondered, given that the GWPF does not think that there is a consensus amongst active climate scientists with respect to AGW, why the GWPF doesn’t simply select the scientists on its Advisory Council randomly from active, senior climate scientists? That way you’re likely to get adequate exposure to reputable scientists and if it’s random – and there’s no consensus – those selected are unlikely to have any particular bias. Do you think Nigel Lawson would agree with such a suggestion? Maybe someone could suggest it if they ever bump into him somewhere. This entry was posted in Climate change, Global warming and tagged CLOUD, Freeman Dyson, Global Warming Policy Foundation, Henrik Svensmark, Nigel Lawson, Paul Nurse, Richard Lindzen, Royal Society. Bookmark the permalink. I see your Freeman Dyson and raise you a Stephen Hawking. Indeed, that’s the issue with appealing to authority. Because they would say ‘Thanks, but no, thanks”? Reich, that is indeed a possibility that I hadn’t considered. For me it is hard to believe that that is not considered. May I ask you why you did not take that into account? Society is a an unpredictive lot. (Answer only if you want to, your choice, I will not think any different if you answer or not). The GWPF has a dandy set of connections, or at least, its Chiarman of the Academic Advsory Council has a good international list of emails,as found in FOIA Facts 5 – Finds Friends Of GWPF. I would love to read Paul Nurse’s version of events because I smell bias in that Spectator article. One sentence in particular is a bit insulting, “What was clear, however, was that they had no understanding of, or interest in, the massive human and economic costs involved in the policies they so glibly endorse.” This could easily be applied to Nigel Lawson who seems to have no understanding of the massive human costs involved in business as usual. I have recently come to the conclusion that there are too many economists involved in the attempts to find a solution to AGW 🙂 This is an ethical problem and it requires an ethical solution and the ethical solution is not necessarily going to be the cheapest. Surely the point of the meeting was to discuss the scientific basis for action on climate change, not the policies themselves. Anyway it’s clear that Lawson went to the meeting determined to defend his position, not with the intention of actually learning something. His arrogance is astonishing, or at least it would be if it hadn’t already been much in evidence previously. And the reason why Lawson picks those particular “expert advisers” is because they tell him what he wants to hear. Reich, firstly the end of my post was meant to be somewhat tongue in cheek, so I wasn’t really taking it seriously in the first place. The only reason I hadn’t considered it was because I wasn’t really suggesting it seriously. I’m sure that had I considered it seriously then your point would have been patently obvious. Andrew, indeed. It would be surprising if Lawson and whoever went with him were going to actually discuss climate science with experts. It’s much more likely they were going to tell the experts they were wrong than to actually listen to them. I suspect they came away thinking they’d probably somehow won something. Interesting that two science advisors contradict each other. Lindzen has long gone the low climate sensitivity route, however Svensmark argues otherwise. He claims the climate is sensitive, to cosmic rays in particular. Not that I suspect further advancing scientific understanding is a consideration for either – the planet has been warming for as long as Lindzen has been proclaiming that it won’t. Rob, but isn’t the issue that people who propose that it’s GCRs or the Sun are also proposing that the climate is (magically) not sensitive to other forcings such as greenhouse gases? I fully agree about that. Lawson’s position has nothing to do with science, so talking to scientists would be an utter waste of time. Lars, yes that is an interpretation I hadn’t considered (I seem to be doing a lot of that at the moment). So one can’t accuse him of not telling the truth? The arrogance of the GWPF is quite breathtaking and has a media presence out of all proportion to its membership. Due to the perceived necessity to have a ‘balanced’ debate whenever climate change is mentioned in the UK media they are wheeled out as the sceptics of choice. The most worrying aspect of their operation though is their connections and hence lobbying strength within politics. You just know their influence is gaining traction especially with those on the right of British politics. ashsustain, indeed it is both breathtaking and concerning. It might not be so bad if they were influencing the debate on policy, but they’re actually influencing how the BBC (for example) reports on climate science itself. This has involved including Andrew Montford in a report on climate science and then having to resort to Bob Carter because no climate scientist (or possibly just scientist) in the UK was willing to present a dissenting voice. I wrote that before I read the story in the Independent this morning…. I think their success is evidenced by one political party positioning itself as anti-science (UKIP) whilst elements of another are happy to play to this crowd. If the Climate Change Act (2008) went through parliament again today I wonder how many more MPs would vote the other way? Not because the science has weakened, the just the attacks on it have become more effective. Yes, I think UKIP are playing quite a significant role in defining other party’s views on climate change. It’s also interesting how many of those on social media who are climate sceptics and from the UK are associated with UKIP. I wonder what kind of person it is who so often believes that he has encountered others who have “no interest in massive human… costs.” What would it be like to think that you inhabit such a dark world, filled with so many sociopaths? It would be a very scary thought….if they actually believed it. I don’t think Nigel Lawson really believes what he is saying though. I don’t think I actually believe that Lawson and others have no interest in the human cost of what they support. I suspect that they believe so strongly in their own policy preferences that they don’t consider that they might be wrong and that alternatives may be better. I do sometimes suspect, however, that when their particular ideology doesn’t work (banking crisis for example) they then find something else to blame and so find a way to excuse the failure, rather than accepting that maybe the world isn’t quite as simple as they would like to believe. Lawson might actually believe this stuff, among other things, I’d guess he believes his in-law Viscount Monckton, who certainly believes it. I do wonder if this doesn’t explain some of the confusion. For anyone interested in reviewing Lawson’s legion of errors, there’s a comprehensive debunk by Sir John Beddington here. Another Krugman riff on the propensity of economists to abandon economics when it comes into conflict with ideology. What’s going on with e.g. Lawson and to a lesser extent Tol is not happening in a vacuum. Steve, was that the link you were intending to include? Oops, no, here’s the correct one: http://krugman.blogs.nytimes.com/2013/11/27/the-trouble-with-economics-is-economists/. Sometimes I have trouble with British English. Maybe by “eminent” Lawson means “wrong”? There’s certainly no climate scientist who’s been so consistently wrong for so consistently long. It’s certainly true that ‘it’s GCRs’, ‘it’s the sun’, and ‘sensitivity is low’ are contradictory arguments (not to mention each being wrong), but I doubt anyone at GWPF cares. I imagine Lawson started babbling about how mitigation is supposedly expensive, the Royal Society scientists responding that they were there to talk about science, not economics; hence Lawson’s claim that they don’t care about costs. Frankly it seems like a total waste of time by Nurse et al., as I’m sure they now realize. Trying to educate those whose ideology and agenda won’t allow them to be educated is pointless. No, “eminent” definitely does not mean “wrong”. I think you’ve got it spot-on with the bit about Lawson babbling on about costs while the Royal Society talks about science. Some economists do seem to think that they are scientists. Those letters are fascinating. Lawson writes in the first one that his case primarily rests on the “economic costs of tackling climate change”. But then he makes a whole heap of statements about the science. It’s so painful to read. I think Beddington was far too nice to him. Anyone care to dismantle this piece of GWPF propaganda in the Telegraph today? I’m sure other people will have more sensible things to say about it than I do, but I’ll put in my two cents’ worth anyway. The article spends a lot of time hammering green subsidies but does not mention fossil fuel subsidies. I always find this inconsistent. Why not? If you are against a subsidy simply because it is a subsidy then it should apply across the board. The other glaring absence for me is that there is no mention of the human cost of climate change to generations in the future. On the one hand we have the GWPF warning of huge financial costs for people of today and on the other we have a situation where vast swathes of the Earth will become uninhabitable to humans if we stick with business as usual. And this latter situation will continue for 100s of years. So we are comparing a financial cost today with an enormous human cost in the future and there is no way that the financial cost today can ever take preference if we view this from a point of view of utilitarian ethics. We have to expect that we’re going to have to pay because the consequences for future generations are so dire and there will be a great many more generations who suffer as a result of business as usual than the two or three generations today who have to make sacrifices. What would have been better is to have that private meeting( ie nobody has to be seen to win in front of the media) and then come out with a joint statement saying what they actually agree on. Broken down into areas, science policies, economics. Which I think would be quite a lot. Prof Radley spoke recently that often what is being discussed in terms of science, is actually poltics, policies economics. I saw him speak at Eco Hub, and I recall an article where he said the same. To move forward. Agree common ground and discuss the rest. Barry, here’s how I see it. The issue that the Royal Society has is that it appears that the GWPF is not getting suitable scientific advice. I completely agree. Given who’s on their Advisory Council and what’s in their reports, it’s hard to conclude otherwise. The point of the meeting was then, I believe, to give GWPF members a chance to discuss climate science with actual experts. Hence, there’s no real reason for a press presence. The Royal Society was unlikely to present anything that isn’t in the published literature or summarised in the IPCC reports. I also don’t believe the meeting was about policy. The point was to present credible science to the GWPF so that they could – if interested – base their policies on actual science, rather than science promoted by a minority and that isn’t consistent with the evidence. This whole “why wasn’t the press allowed in” is just another example – in my opinion – of people trying to create a conspiracy when there isn’t one.